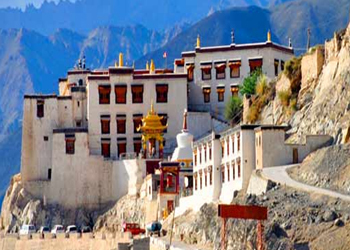 “Alchi Gompa also known as Alchi Monastery is a group of ancient Buddhist shrines that together form one of the most important religious centres in Ladakh. This gompa attributes its establishment to the legendary translator Rinchen Zangpo, who built it in 1000 A.D. by bringing 32 wood carvers and sculptors from Kashmir. It consists of several temples and chortens, which belong to different time period. Some of the oldest existing wall paintings of Ladakh are preserved in this monastery. Three large sized images made of clay painted brightly are its main attraction. The mural of 1000 Buddhas forms the highlight of the ancient artworks displayed here. Imposing statues of Lord Buddha and other deities are present in this shrine. These idols have beautiful wooden carvings and artworks, which can be compared to the artistic style of the Baroque period. In present times, this gompa is counted amongst the prime attractions of Leh and is promoted as a part of cultural tourism in the region. Numerous tea stalls, shacks, restaurants and souvenir shops have been established near the monastery.